To celebrate National Canned Food Month, I’m answering all your questions regarding the safety, nutrition content, and benefits of including canned food in your weekly eating rotation. Pin Your Questions: Canned Food Here! The link to my segment on Indy Style is here! 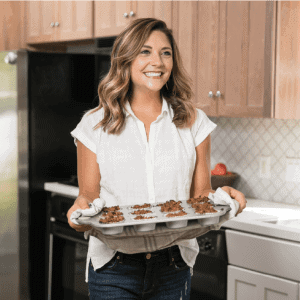 Today, I am on Indy Style sharing delicious recipes for a Pineapple Coconut Smoothie, Chickpea Walnut Blondies, Tuna Cakes with Dijon Sauce and Eggplant Skillet Dinner. 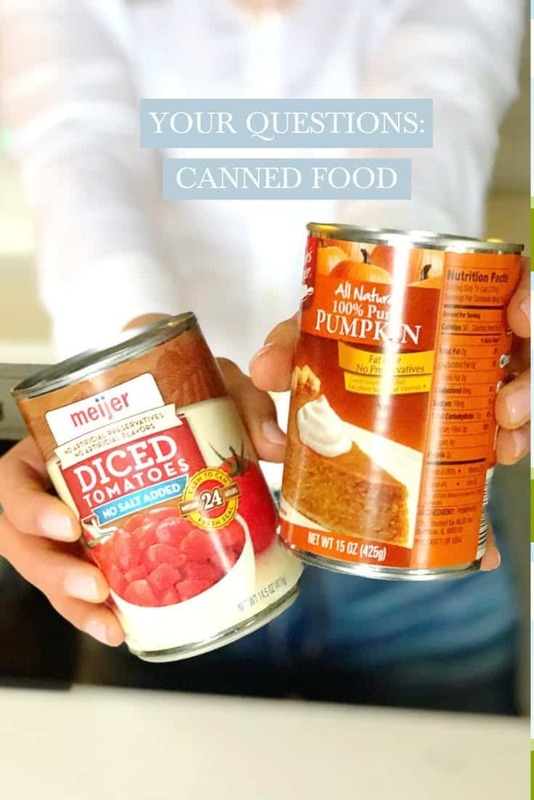 It is National Canned Food Month, so I have been celebrating by creating recipes using the most popular canned food items you have in your pantry (according to facebook and instagram!). In the spirit if “tidying up” (is anyone else a huge Marie Kondo fan!? 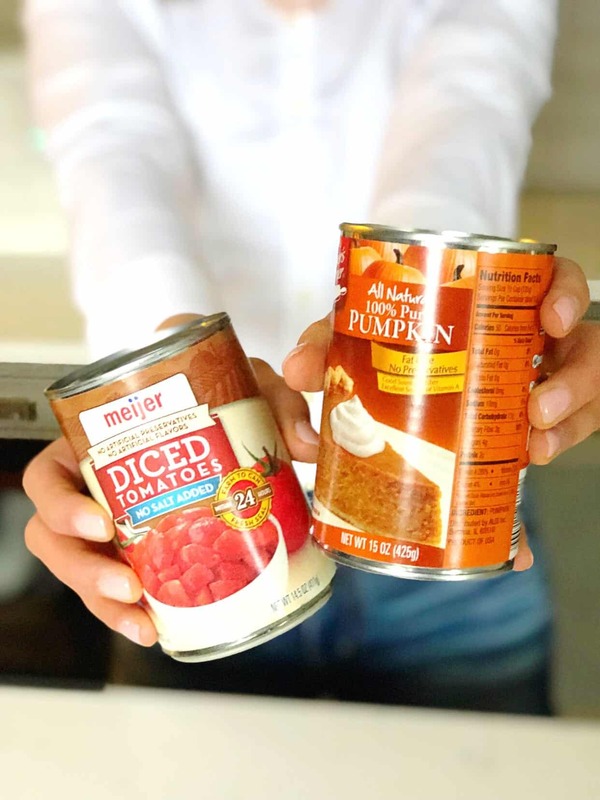 ), these recipes for canned food will help you tidy up your pantry, create some space in your kitchen, and enjoy delicious and nutritious food. Win, win, win! When polling you to find out what canned food you had on hand, I also learned there were so many questions regarding canned food. Below, I share your questions along with my answers regarding how to incorporate canned food into a healthy and nutritious way of living. Is there a benefit to using canned beans vs dried beans and cooking your own? There are pros and cons to both! Canned beans are going to be more convenient and require less time and planning. We know that beans contain B vitamins, plant protein, and fiber among other vitamins and minerals and they are relatively inexpensive. Canned beans may be higher in sodium, but purchasing beans that are low sodium or no salt added will help. Another tip: rinse canned foods for 1 minute to reduce sodium by nearly half. Dry beans allow you to be in complete control of everything that goes into the beans, that means you control the amount of salt and any other seasonings used. Using dry beans do require a little more time and planning ahead, but thankfully with gadgets like the Instant Pot (I still need to get one!) cooking beans from scratch takes much less time. Are canned foods safe to consume? Some cans do contain BPA in the lining of the inside of the can. BPA is a chemical that can affect certain hormones in the body and may be associated with certain health conditions. You can read more about the details of that here, here, here. It is important to note that the lining of cans is not the only way we come into contact with BPA. According to the FDA, the amount of BPA used in the lining of cans is used in an amount low enough to be safe for humans. Many consumers have shared that they want no BPA used in their canned food products, and the industry has listened! Because of this, many companies have eliminated BPA from their canned foods and now include a label on the outside of the can to let consumers know. This allows you to make the choice for yourself as to whether or not want to purchase BPA-free products or not. How long can you keep canned foods? According to the “Canned Food Alliance” guide to referencing expiration dates, when food is kept at relatively stable temperatures it will remain at peak quality for about 2 years after processing but the canned food retains is nutrition and safety beyond the two year mark. The color and texture may be altered, affecting the quality but that’s it! Canned food lasts a long time! If you notice a can is swollen or bulging, leaking, dented, or the seal is broken do not consume the contents. These defects in the can make the food unsafe to consume. Are canned foods high in sodium? When looking at the label, compare options and pick the one with the lowest amount of sodium or one that says low sodium, reduced sodium or no salt added. Low sodium is technically 140mg of sodium on the label. When using a canned food product, you can always rinse it under water for 1 minute to reduce the sodium content by almost half! This is such a helpful post! I already use a lot of canned foods but I feel like I was reminded of all the reasons it’s a great choice! Thanks, Shannon! Glad it was helpful! I’m a canned food fan, too! I love having canned food on hand 🙂 Such a helpful kitchen tool! YAY! Such a good thing to have on hand! Love the instant pot for dried beans! I always keep my pantry stocked with canned foods and it always ends up coming in handy! Great post! I love prepping beans & lentils from dry, but since becoming a mom I’m definitely keeping more cans in the pantry than ever for convenience! Love this Q&A! Great post for more info on canned products.